There are just a few days left until Thanksgiving, which means (just as importantly) there are only a few days until Black Friday and the official start of the holiday shopping season. There’s one more thing you need to remember this weekend–stop by our shop! 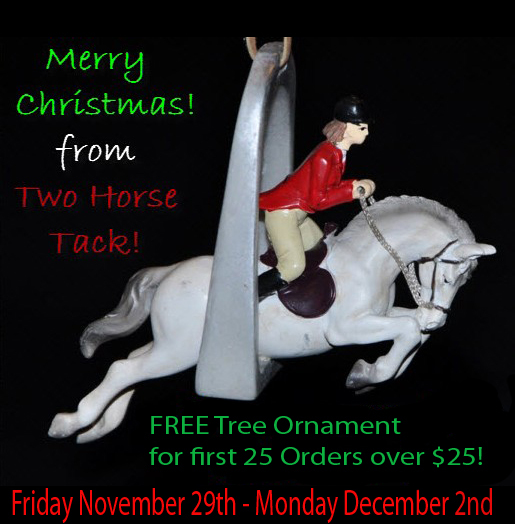 We’re sure to be on your horse’s Christmas list, and we want to be sure you get something in your stocking, too. For each of the first 25 orders of $25 or more on Black Friday, we’ll throw in this adorable ornament for free. And, because we’re a web-based store, we’ll also be running this deal on Cyber Monday, so make sure Santa’s elves know our web address. Whether you want to admit it or not, everybody has a “type.” For some, it’s tall, dark, and handsome. For others, it’s a steely fellow with a soft brown eye. And then, there are the redheads….as long as they have plenty of chrome. Stitch is modeling our Western bridle with bling. If you go weak at the knees over a flashy chestnut, we’ve got the horse for you. “Stitch” is a 5-year-old mare off the track who is looking for someone who’s just her type. While racing wasn’t her thing, Stitch (known on the track as Stitch’s PublicPick) is ready for a new life of pleasure or trail riding, or possibly even some light jumping. Like some of us, Stitch is a bit of a sensitive soul—she needs someone who’s quiet and gentle in the saddle and on the ground, and in return she is happy to give affection and tries hard to please. Stitch ran her last race at Indiana Downs in September and is currently part of New Vocations Racehorse Adoption Program. 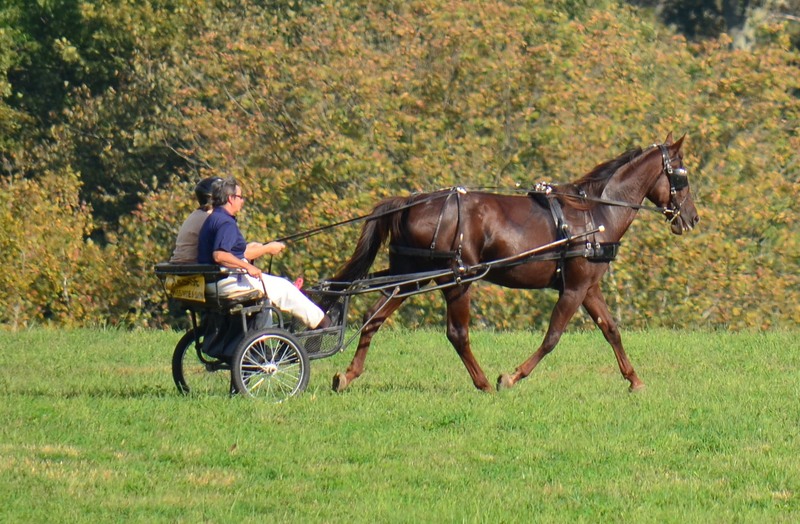 New Vocations retrains, rehabilitates, and rehomes Thoroughbred and Standardbred racehorses off the track. The program, which is based out of Ohio, has placed nearly 5,000 horses in qualified homes since 1992. One of Stitch’s current career interests is becoming a model—here she’s seen modeling a western bridle with bling made of beta biothane from Two Horse Tack. 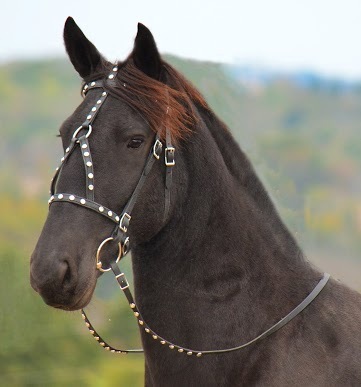 This bridle is fully adjustable and comes in a range of colors and bling options. Best of all, it will hold up to even the dustiest of trail rides without cracking or fading, and can be rinsed under the hose to be good as new. Whoever adopts Stitch will receive a free $50 gift certificate to Two Horse Tack to keep her looking good in her next career. To learn even more about Stitch or to inquire about adoption, click here. WD-40. Not only is it a great tool in getting those pull-on bell boots on or off, this stuff can also be a great hoof dressing for clay-based arenas. Spray on and wipe before you ride and touch up before the next round. It’s also good at keeping ice from building up in a shod hoof, too. Corn starch. It’s cheap and a very fine powder, which makes it good to boost the white on socks. Just rub a little onto clean, dry leg and use a brush or rag to blend until it looks natural–just don’t do this post-hoof oil. Talcum powder works, too. Baby oil. Lightly dampen a rag with baby oil and rub over the nose and under the eyes for a more refined look. Can be lightly applied across the coat for extra shine–just be careful not to overdo it. Hair gel. It’s a girl’s best friend, especially if your horse’s mane isn’t braided. Bonus Tuesday tip: don’t forget to check out our $10 off for 10 days sale on our war bridle. Click here for details! If you’ve ever had a tough day with your horse, just remember–the pros sometimes do, too. This outtake from a Double Dan Horsemanship demonstration at Equitana a few years back shows what happens when the horses go off-script. We love that the Dans kept a sense of humor about the whole thing…and our favorite character in this segment has got to be Amelia. What have you got going on this weekend in the barn? Well, besides this excellent bridle sale, which you should take a look at, it might be time to do some serious fuzzscaping for your horse. While we’ve had a few tastes of winter so far, it looks like this weekend will be a bit more mild for some parts of the country, so it’s a good time to get out to the barn and clip your horse if you haven’t already. Love the halter our model is wearing? Click to purchase. Every year it’s a debate for riders–to clip or not to clip? One of the things you may want to consider when making the decision besides the weather in your area is how often and how strenuously you’ll be working your horse during the colder months. A damp, sweaty coat takes a long time to dry out in the cold air, and if not done properly it can lead to chills. If you plan to blanket your horse through the winter anyway, it might be worth considering whether some form of a clip would be helpful. If your horse lives outside unblanketed and gets the winter off, he may not need a clip. The next step is to decide what style of clip best suits your horse’s workload. There is a huge range of patterns out there and no single style is right for every horse or discipline. Some of them even get creative. Whatever you choose, it’s a good idea to draw an outline on the horse in chalk (which should brush right out); try looking at the horse from the front to ensure that the lines are reaching the same points on the body on each side. Be sure–and, we cannot stress this enough–to start with a clean horse. Dust and dander that hides close to the skin will get caught in the clipper blades, which could damage them at worst and at best clogs them up, creating a striped effect on the horse’s skin where ridges of hair weren’t trimmed evenly. It’s really hard to get these stripes even again although they do grow out eventually. Pro Equine Grooms (which is a fantastic resource) has some great tips for keeping the experience safe for you and your horse. First and foremost–make sure to take the time to acclimate the horse to the clippers. You’ll get a cleaner line if your horse is willing to stay still for this task. Also, try working against the grain of the hair and make your strokes as long and even as possible. And don’t forget to keep oiling that clipper blade! If you’re using a pattern that requires you to clip part of the face, or do a lot of grooming of the cheeks in general, you may want to consider a grooming halter, which has the throatlatch removed for easier access to the face. We’ve got some great ones that are really affordable (and come in cute colors). We just got our first dusting of snow here in central Kentucky–our animals are looking at us like they’re trying to figure out when and how we moved to Canada, and we have no idea what to tell them. It’s gotten us thinking about the yearly struggle to get horses to drink more water during the colder months. We’ve read a lot about the subject, and the most important thing seems to be insuring that the water they have available to them is not frozen. Most farm supply stores sell tank heaters for outdoor water sources, and heated buckets for inside dwellers. Just be sure to do your research on what you buy, especially if you go second-hand, since some older types of bucket heaters may come with a greater fire hazard risk. If it gets cold enough of course, you’ll still need to layer up and troop out to the pasture to break up any ice that may form in a larger tank. Many people add an electrolyte to their horse’s grain or directly into their water to encourage them to drink, assuming that if Gatorade makes us thirsty, it’ll do the same for their horse. Recently though, both veterinarians and horse owners have been split on whether or not this actually works; electrolytes might simply increase a horse’s need for water, which means any extra drinking is just meeting new requirements. If you do choose to feed ‘lytes, experts agree that the horse should have at least one bucket available to them that is free of any additives. Soaking hay in water is also a good way to sneak some extra hydration in. It also reduces dust for horses who may be sensitive to that. We’ve also heard of bribing horses into drinking more. Adding a bit of apple juice to the water works for some horses. Our favorite solution so far? Cutting up an apple and letting the horse go bobbing for his treat. 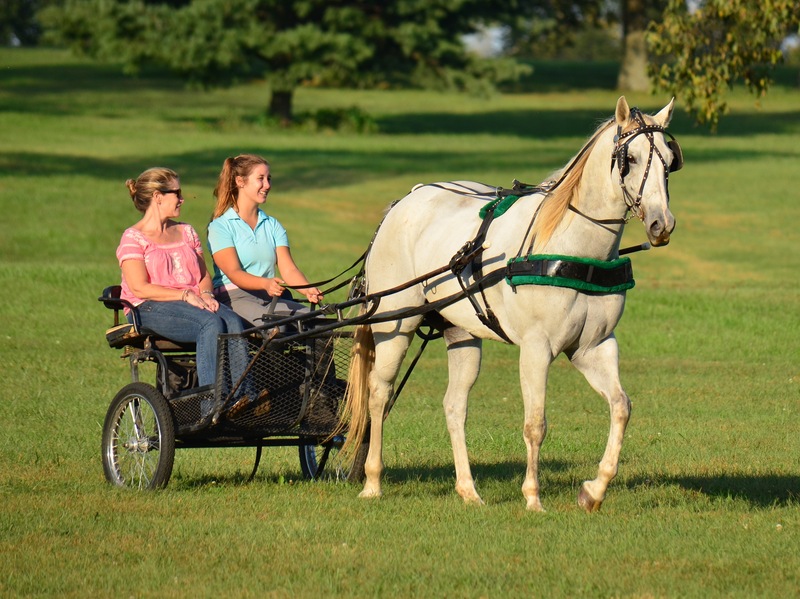 In addition to being riders, we also like to hop in the cart for a drive or two with our horses. And frankly, we’re surprised more horsey people don’t give it a try. It’s a great way to introduce new friends to horses. 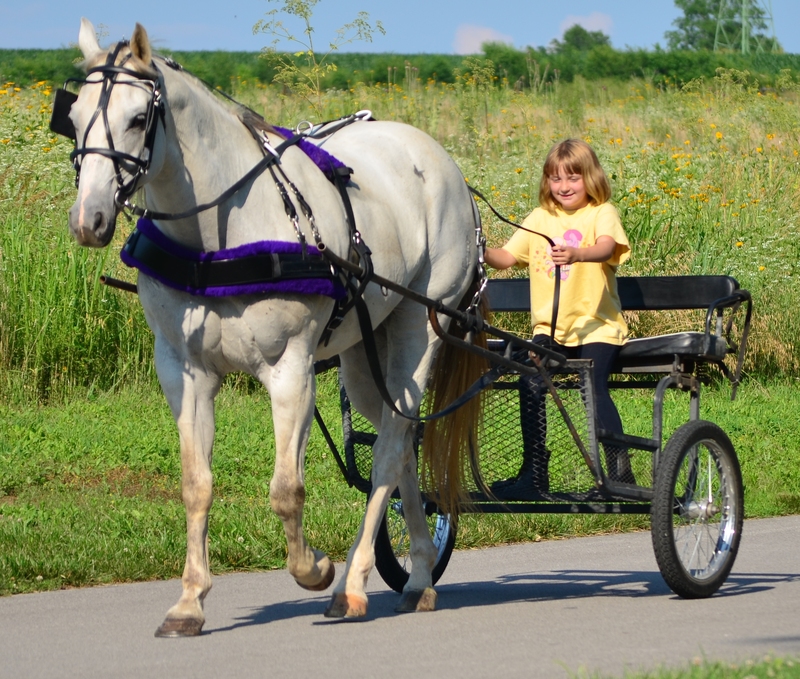 When someone’s riding in a cart with you, they can feel what it’s like to walk, trot, and canter a horse right away, while it would take them months of riding lessons to get a taste of the power behind a horse’s trot or canter. It’s also pretty easy to teach a newbie how to drive, compared to the complexity of learning to ride (heels down, shoulders back, eyes up, hands even!). It’s a great bonding activity. We’ve all been there–trying to explain to a friend or significant other the joys of owning horses. Driving is something a non-riding boyfriend or girlfriend , friend or family member can do and enjoy with you. 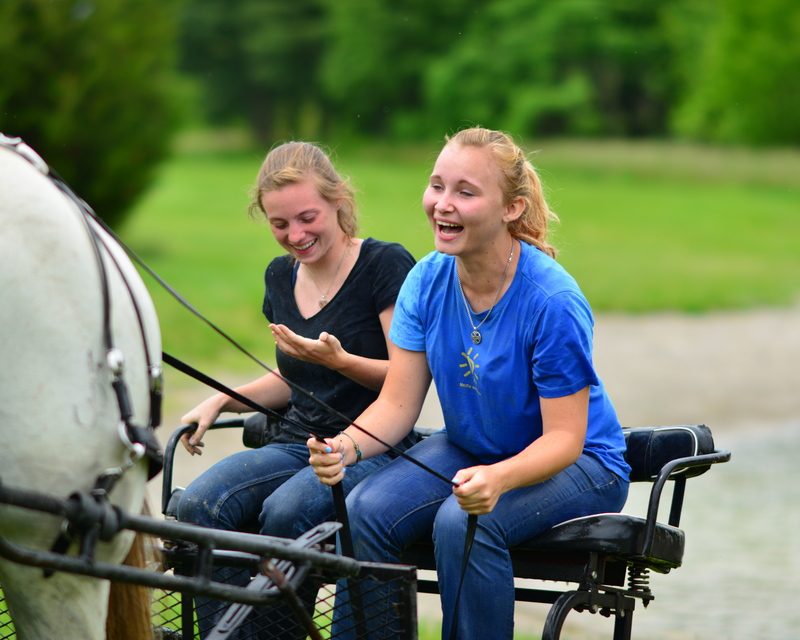 Depending on the horse and cart, you can even let them take the reins and show them firsthand how you experience your horse. It’s also a great time to catch up with friends–the act of driving and the sites you see provide natural conversation starters, and you’re not as likely to be as distracted as you are when riding and trying to listen to your horse and fellow riders. I have had some of the best conversations seated behind my horse. It’s a way for elderly people or those with medical limitations to enjoy the outdoors. 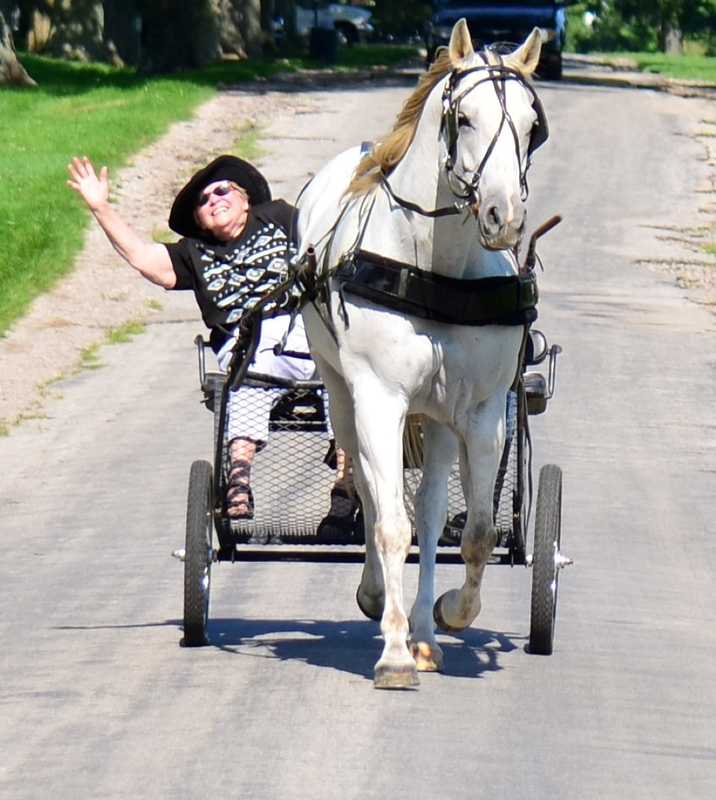 For people who have an old injury or illness that makes a long hike through a park impossible, hitching up the cart for a drive is a great alternative. 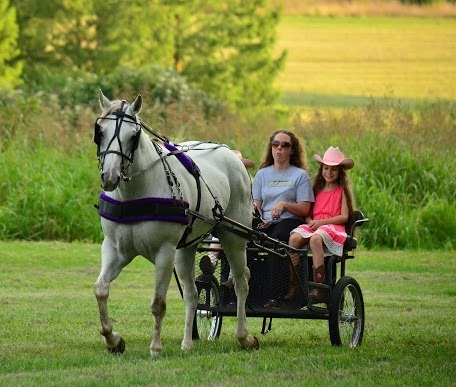 Terry and her 2 daughters are newcomers to the horse world. They were all able to make driving their first horsey activity! It’s easier on the horse. 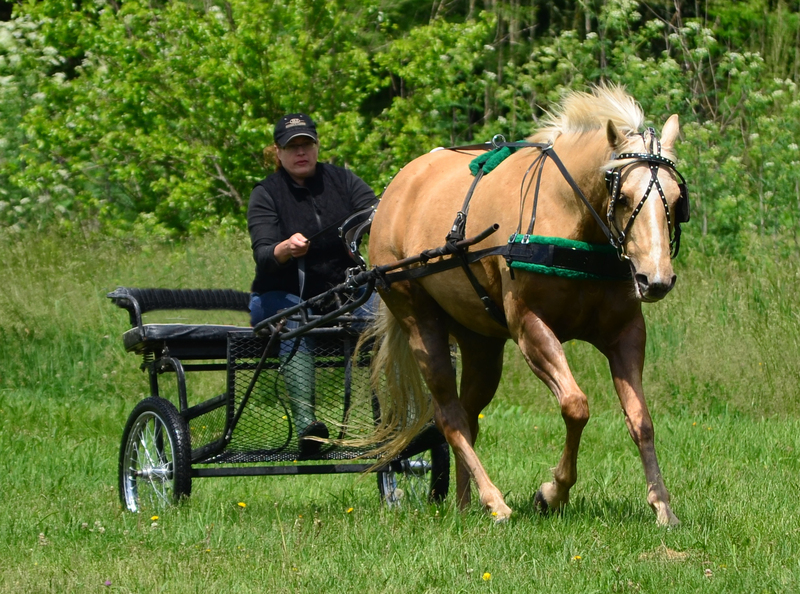 Horses can hit the trail for longer in front of a cart than they can under the saddle–it’s physically easier for them to pull than drive. It’s also not as tiring for the driver as riding can be, so you can enjoy it for longer, too. It’s great fun for smaller children. 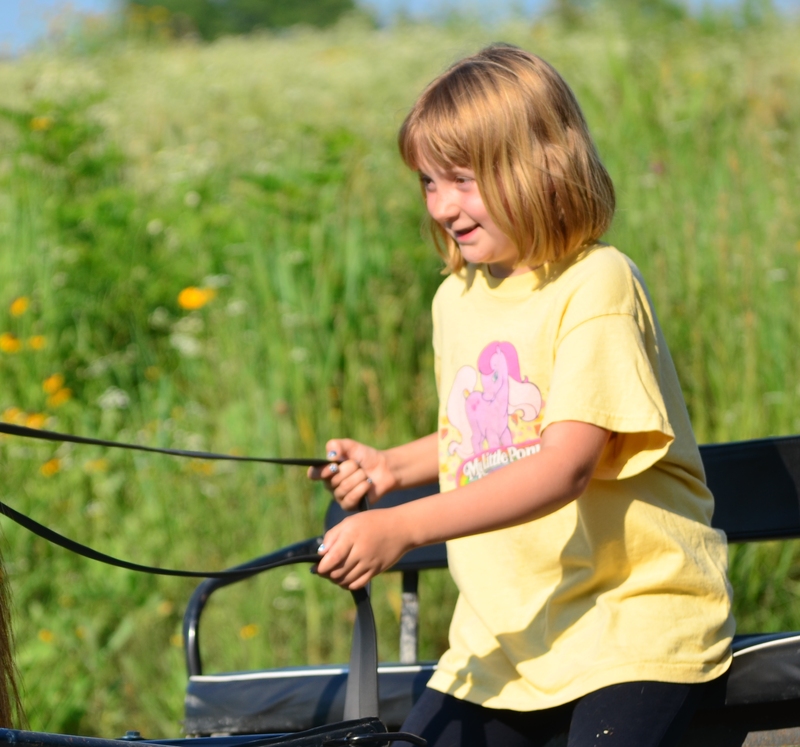 It takes some time for kids to establish the balance, motor skill, and body control needed to go on a trail ride on their own horse, and riding astride poses some safety concerns. Little kids can ride in a cart next to a driver however, or learn to drive themselves under appropriate supervision. 7 year old Isobel Hampton takes the reins for the first time! It’s a great way to exercise an older/younger horse. A horse can pull three times its body weight but can only carry about 20 percent of its body weight. Because it’s pretty low-impact exercise, it’s great for horses who may be too arthritic or injured to do much under saddle work but may still need some exercise. It is also great early training and conditioning for younger horses you may not be fully developed yet for riding. It’s a new way to experience your horse. Behind the cart you will learn the true meaning of “horse power” Perhaps counter-intuitively, the faster a horse and cart go, the smoother the ride is–it feels like you are gliding!. Can’t afford a Cadillac? No problem. Just get a cart. As you might have guessed, Two Horse Tack offers both a marathon and a pleasure driving harness in our shop–both of which are made of beta biothane (the marathon harness is modeled in these photos). The materials look and feel like traditional leather while remaining light on the horse’s back, and very easy to clean–just douse the harness with the hose–and it doesn’t require oiling. If you’ve had to take apart and clean and oil a bridle, just imagine how tough a harness is to get properly clean! Not only that, we design our harnesses to be good starter pieces for people who’d like to learn to drive or do so in their spare time, so both our harnesses are affordable and come shipped to you in just two pieces, making it much easier to get started! Here are pics of just a few of the folks who have discovered the joys of driving! Belle & her Mom’s first drive. This was a Mother’s Day treat for her out of town. The perfect way to experience our beautiful state! 80 years old Rhea is over the moon about her first drive. Greta & Becca after their first water obstacle. These girls did great! One quick lesson beforehand and they were able to tackle a mini obstacle all on their own. 7 years old and already a devoted horse lover, Isobel Hampton triumphant smile after being handed the reins for the first time. The girl is a natural!